Credit repair is one of the hot topics online and while others know exactly how it works, others sternly dispute any credibility of such businesses. There are many cheap credit repair companies in the market and finding them is never a daunting task. However, not all affordable credit repair companies guarantee desirable services. Guarantee? Sky Blue is one of the only credit repair services that offer a full 90-day refund no matter what the reason. Apply NOW:——>> Visit Sky Blue Credit Repair website. In fact, you risk spending your money on scam offers that will never meet your needs whenever you are in the market for such companies. Nonetheless, this does not mean there are no reliable credit repair businesses around. It is important to understand exactly what you will get from companies that repair credit. Most people assume that these companies will repair all aspects including legitimate information of bad credit dealings. The truth is that credit repair involves very little. Companies that offer these services cannot remove non-negotiable information from your credit report. They do not have that jurisdiction. All they can do is negotiate the removal of some bad information that must not necessarily exist in your reports. They also contest all wrongful information and seek letters of good faith from your debtors. When it comes to price, Sky Blue Credit Repair offers affordable and cheaper credit repair services. When you sign up for their credit repair services, you will be required to pay $69. After this, you will continue to pay a monthly fee of $69 as long as you continue to receive their services. The additional costs at this company only come about if you would like to have credit reports.These are offered either monthly or through a one-time kind of access where you are allowed to see your credit report once without having to pay for it on a monthly basis. To get the monthly credit reports, you are required to pay $14. 95 monthly. For the one-time access services, you will have to pay a total of $29.95. If you decide to sign up with your partner, Sky Blue always offers a 56% discount on your partner’s signup fee. This is one of the things that a lot of customers seem to love about this company. One thing that attracts a lot of people to certain credit repair companies is the fact that they use different online tools that appear to be very fancy. This is one thing you will not find at Sky Blue Credit Repair. Sky Blue credit repair uses strategies that are very straight forward in order to help you solve your credit problems. One way they do this is by ensuring that fix all the mistakes that you have made on your credit report. They also send letters to lenders to give you a chance to create a good reputation. Most importantly, this company will go above and beyond to ensure they have identified all possible loopholes to your credit in order to help you get your score to where it should be. Available from 9 a.m. to 5 p.m. on weekdays. When it comes to choosing this company, it is very important to ensure that the company you choose is transparent in how they conduct their operations and follow regulations. The company should also be one that has high Better Business Bureau ratings. Sky Blue credit repair is a company that has been around for a couple of years now and has managed to maintain a good reputation. Back in 2014, they got an A+ rating from BBB. Sky Blue Credit Repair is indeed one of the most reliable affordable credit repair companies you can ever run into in your search. Its Best Overall (Least Expensive, Best Guarantee). Unlike many other companies, they do not promise more than they can offer. In fact, they only help correct errors and wrongful data included in the credit report history and seek good faith letters from your debtors among such activities. They also negotiate some information that can be removed from your reports without being illegal. Other services offered to help you maintain good score include credit monitoring and advice on how you can go about building strong credit. 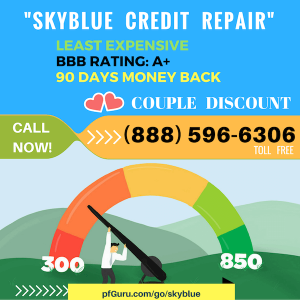 Sky Blue Credit Repair also offers a full 90-day money back guarantee and only charges $59 for the start and the same amount every month. If within the 90 days you fail to note any desirable change or benefit, you can claim all your money back. The company has an “A” rating on BBB and many other expert review sites. The advantage of Lexington law credit repair is that it is a law firm that deals with credit law and knows exactly what is to be done. and it has Best Reputation in the market. They charge $97 for the start and $79 for the following months. Lexington has been in the credit law industry for several years and boasts profound experience and insights. The company works using a no-win-no-fee type of model which means you only pay them once you get the results you were hoping for. As a law company, they know a lot of areas they can manipulate in your favor to ensure the credit reports are better than its initial status. Ovation is rated A+ and promise to repair your credit card for $89. They refund your money for any dissatisfaction with the service and also seek good faith recommendation letters to increase your scores. Ovation is one of the most reputable credit repair companies and they are known for affordability, reliability and exceptional customer service. It enjoys numerous positive reviews online and gets most of their business from recommendations and referrals. They are also known to have thriving relationships with credit reporting unions and bureaus. This gives them an edge in knowing all the elements that influence credit ranking. Their money back guarantee does not have many underlying clauses to delay refunds. Learn more about Ovation Credit Repair, here or call to talk to a live person. As a company with a healthy relationship with the TransUnion, this company can pull your credit report and monitor elements that pull down your score. 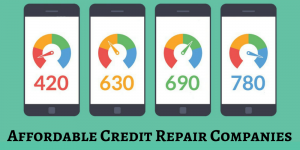 They are definitely one of the most reliable credit repair companies and have a professional advisory team to help you understand your credit score and every aspect that influence the same. Their only con is the $89 per month price tag but it is worth every penny as they actually help monitor and repair your bad credit. They have also repaired bad credit for quite a long time and have a long portfolio to evaluate. Like many other top-rated companies, CreditRepair.com has numerous five-star ratings. Learn more about CreditRepair.com here or call to talk to a live person. With over 14 years of experience, The Credit People company promises better credit scores for $79 a month with no monthly outgoing fees. They have a 100% money back guarantee and since there is no contract, you can cancel at any time. It is a large community with credit experts and healthy relationships with credit unions. They understand how everything works and what can be done to repair various bad elements in your reports. What’s more, they offer competitive credit repair prices and are just as good as the top-ranked companies. The Credit People , are notable for reliability and flexible arrangements. You can get back your money if you ever feel like they are not doing enough to make your credit better. Moreover, there are no tiers that keep your engagement. In conclusion, Sky Blue Credit Repair is exceptionally good company when it comes to offering high-quality credit repair service. You get different things from each company but most importantly, you get to have your credit score improved. Sky Blue has affordable and very reliable customer services. There are many other top class dependable credit repair companies in the market. In essence, credit repair will only work to dispute errors in your credit report or negotiate information that can be easily removed. However, they will have no help in removing legitimate information that daunts your credit score. Nevertheless, most credit repair companies offer the money back guarantees if you are not satisfied with their services. This simply means there are some reliable credit repair companies that can help you. It is generally advisable to choose credible licensed companies that are allowed to offer the service within the given area. This will give you accountability, convenience, and insurance on quality services. All credit companies promote their offers as the best which is often untrue. Make sure you review aspects of experience, reputation, affordability, insurance, and guarantees as well as the credibility of the business. so many useful info right here in the put up, we want develop extra strategies on this regard, thank you for sharing. I don’t even understand how I ended up here, but I believed this put up used to be great. happen to aren’t already 😉 Cheers!